This little squirt is officially crawling. She took longer than the others to start crawling, but I'm really okay with that. I was hoping she would stay little forever. She took her first crawl on Friday and now she is a pro. She's all over the place and starting to get into things. She has a pretty crazy smile with her five teeth all different sizes. Sierra is the biggest mommas girl. She is content as long as she can see me. She doesn't take kindly to strangers either. She is the cutest bug ever and she makes me crazy happy. Look at those blue eyes! What a cutie. Your babies are growing up! How are you guys doing? Are you all settled in for now? It's been so long since I've been "blog stalking"! lol! Hope all is well with you and your family! 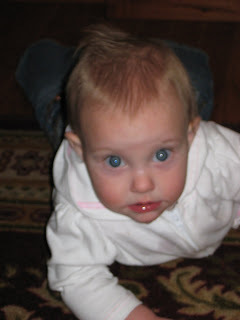 Can't believe your baby is crawling! Ok so you need to blog about this up and coming Baby!